Pull up a chair around Lynda Sparshatt's fireside, to learn more about chairs, craftsmanship and what inspires us. I planned my trip to Den Haag and Delft with art in mind. 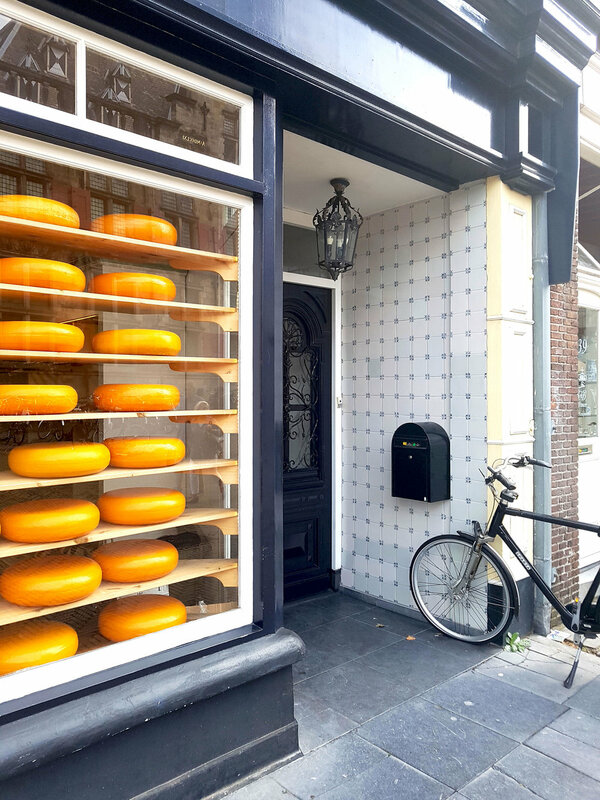 I knew I wanted to see Vermeer, Rembrandt, as many Dutch Masters as I could cram in, alongside eating hand-made chocolates, purchasing extortionately priced Delftware and exploring the cobbled streets of these beautiful cities. In honesty, I loved Den Haag, but as soon as we got to Delft we realised we had underestimated it. As pretty as Amsterdam and far less crowded, Delft is small, but full of interesting shops and independent cafes, and there is plenty to see. There's the Royal Delft museum, the Windmill, the tomb of William of Orange, and many of the winding canal streets that on market days are stuffed with antique wares. Delft is definitely on my list to go back to. Unfortunately the blue skies did not follow us to Den Haag, but it was still a beautiful city. The centrepiece is the Mauritshuis Gallery and the King's palace, both of which are surrounded by cobbled streets with boutique shops and cafes. In the background you can see the skyline of the more industrial and commercial side of Delft which has some skyscrapers with interesting design. Our first stop was the Mauristhuis Gallery, which is the yellow building on the left of the picture above. The gallery isn't huge but it is certainly filled with an excellent collection and the interiors are as beautiful as the art. 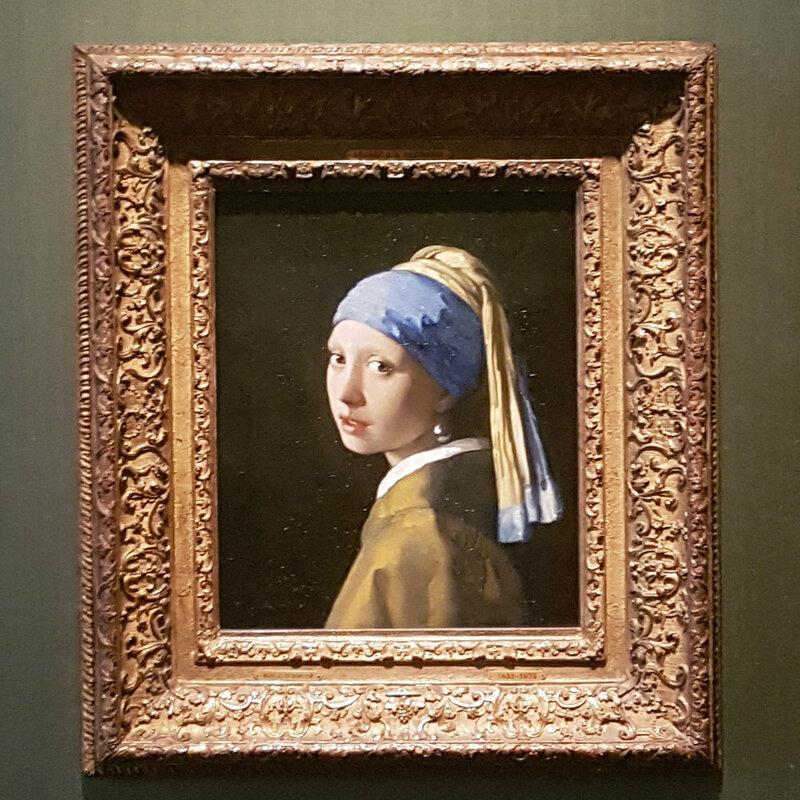 The gallery holds The Netherland's most famous painting, The Girl with the Pearl Earring, which most people seem to think is in Amsterdam but is in fact in Den Haag. There is also Vermeer's famous cityscape of Delft, plus Rembrandt's incredible painting of Amsterdam's surgeons learning about the workings of the arm. Be warned, the museum is pretty expensive, at 15 euros per person, but it was also not particularly crowded and you have the freedom to get very close to the paintings to enjoy them. 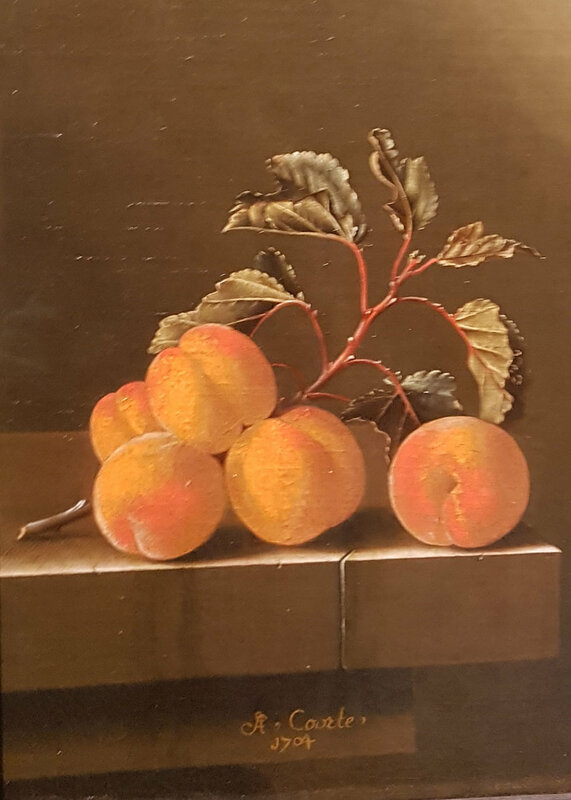 I love the Dutch Still-Life paintings, so I have included some photos of my favourites, plus some close-ups of the details and the interiors so you can get a real feel for the place and what it has to offer. There were plenty of names I hadn't heard before despite following the Dutch Still Lifes around Europe, but everything there is absolutely exquisite. I want to base a collection around the Masters and the style of The Netherlands that is so distinctive. I couldn't wait to get home and copy some of the motifs I had seen onto fabric, and to try out shooting chairs and cushions with the distinctive light of the Dutch oil paintings. Details like the brocade on the front of a dress or the lace on the shirt sleeves, are all things that I can incorporate into my designs for furniture and upholstery. About 12km from Den Hague, is Delft. Delft is the home town of Vermeer and a smaller, prettier version of Amsterdam. There aren't any Vermeer paintings left in Delft, which seems a little sad, but it's a medieval city with so much character it feels easy to imagine how it was back then and how it would have inspired him. As well as claims to Vermeer and William of Orange, Delft is home to the world-famous Delftware. Originally made in Delft in response to the demand for highly-prized Chinese earthenware, Delftware started life as a cheaper imitation of the eastern imports until it found a life of its own and began drawing scenes closer to home, windmills, farm hands harvesting etc. The Royal Delftware Museum in Delft is a fascinating walk through the history of Delftware and the perfect place to pick up some of your own to take home with you. But beware you may need to start saving for it ASAP. The rest of the city is about as Dutch as they come. Windmills, cheese shops, giant cloggs, constant fear of being run over by someone on a bicycle, and typical Dutch Golden Age buildings. Saturday is market day and the town is filled with plenty of antiques, delftware and cheese. The Van der Burgh chocolate shop is well worth a visit, the smell alone is heaven. If you go to Delft or Den Haag, then do write and let us know what you enjoyed there!